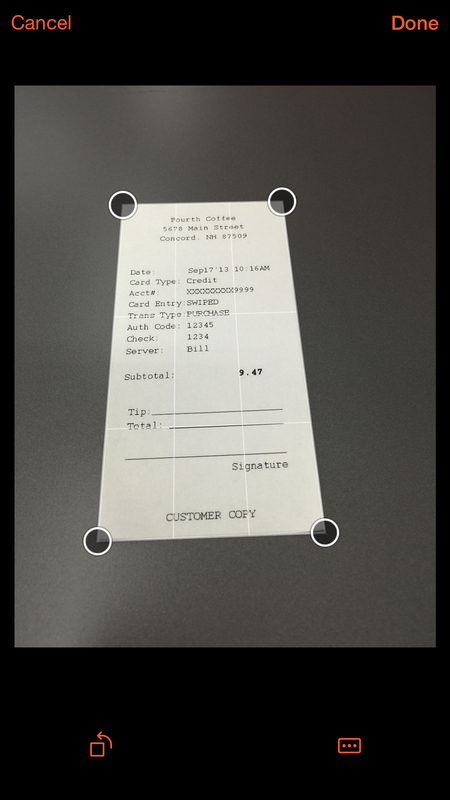 Office Lens is a great way to capture notes and info from whiteboards, menus, signs, handwritten memos, or anything with a lot of text. You don’t need to jot down notes, rely on blurry images or worry about misplacing anything. It’s great for capturing sketches, drawings and equations too, and even images without text. Office Lens gets rid of shadows and odd angles so images are easier to read. You can upload document and whiteboard images to Word, PowerPoint, OneNote, OneDrive, and you can save them as PDFs or send them in mail. You can download the latest version of Office Lens for free from the App Store. 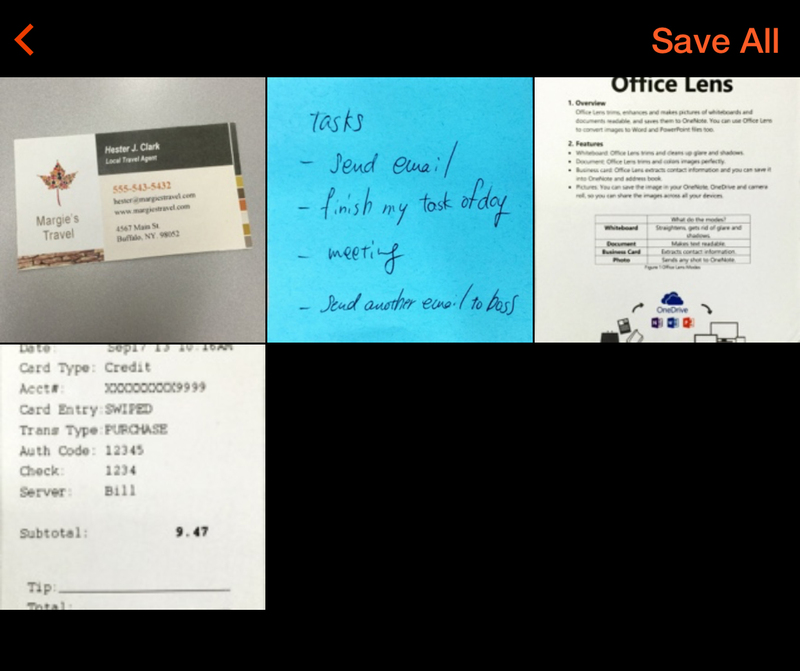 As soon as you open Office Lens, you can choose your mode — Business Card, Photo, Document, or Whiteboard — so Office Lens can make the image look its best. If you are using an iPhone 6s or 6s Plus, you can choose the mode by pressing and holding the Office Lens icon on the home screen. Note: This article uses screenshots taken from iPhone, although they also apply to iPad. Business Card This mode will help you extract contact information and save it into your iPhone or iPad's contacts and into OneNote. This feature currently works best with business cards in English, German, Spanish, and Simplified Chinese. Photo This is a good mode to use if you’re capturing images of scenery or people. Document This mode will help you get the most out of small words and details on a page. It’s great for things like posters, fliers, or restaurant menus. Whiteboard Use this mode to capture notes. Office Lens will adjust images so the background isn’t too bright and the words are easier to read. It’s an ideal setting for blackboards and sketches, too. Choose whether or not to use a flash, and then make sure the frame lines up with the item you want to capture. Use the Camera button to take a picture. If you prefer, you can import an existing image from the Photo Library on your device. 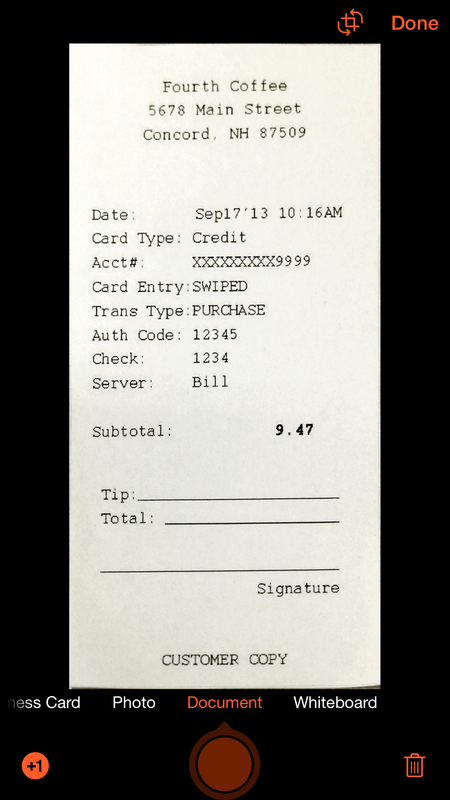 If you want to retake the photo, tap the Trash button icon to delete and then retake the displayed image. If you want to take more photos, tap the Take More button. Use VoiceOver to get real-time voice guidance—like “move right,” “move up,” and more—to take the right picture when you can’t see, have low vision, or blindness. Learn more. You can edit your image before you save it so it’s exactly the way you want it to be. Tap the Crop and Rotate icons to edit the picture. Use the Crop feature to trim away any parts of the image that you don’t need. You can also add a caption to the image. This caption will be used as the alt text in OneNote and the file title on OneDrive. After you edit an image, tap Done. If you take more than two images, Office Lens will show all the images you took in the gallery. For captures taken in Photo, Document, or Whiteboard modes, you can save images to OneNote, OneDrive, as a Word or PowerPoint file, or as a PDF. 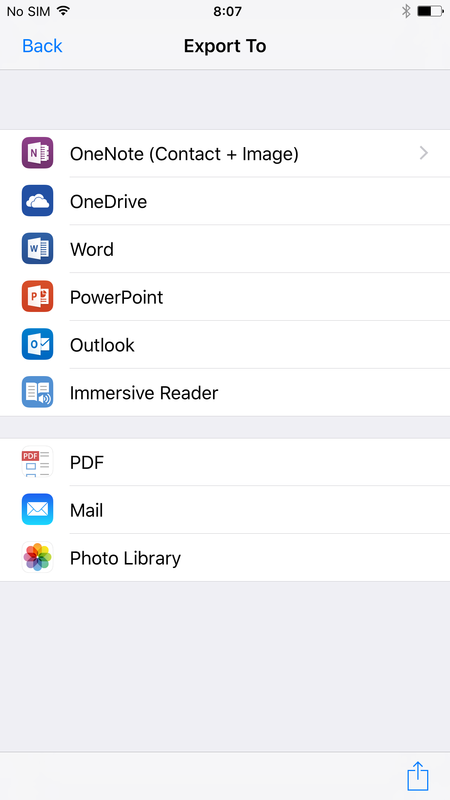 You can also send scanned images through Outlook or local mailer, or save them in your iPhone or iPad’s Photo Library. If you would like to read the text immediately, select Immersive Reader to read the text aloud. Learn more. You can save your captures to Gallery or as a PDF without an internet connection and don't need to sign in to the app. In order to upload your captures to OneNote, OneDrive, Word, or PPT, you will need an internet connection and be prompted to sign-in. Note: When you save an image to OneNote, OneDrive, as a Word or PowerPoint file, or as a PDF, you’ll be prompted to sign in with your Microsoft Account or your Work or School account. 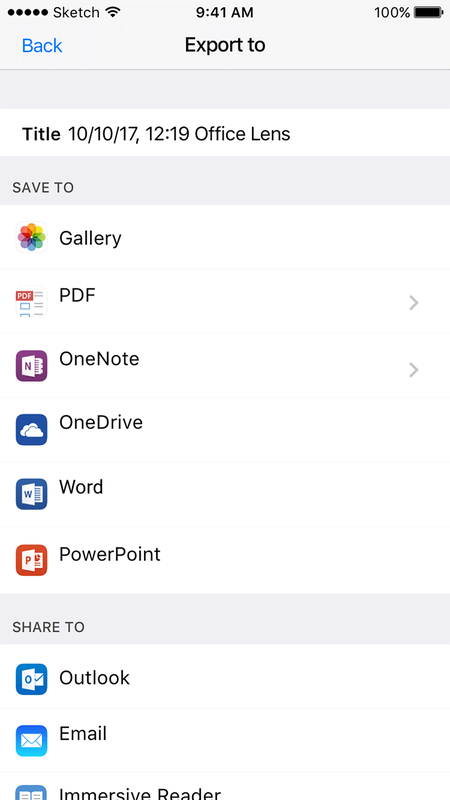 For captures taken in Business Card mode, tap OneNote (Contact + Image) to save the image to your iPhone or iPad's contacts as a vCard (.vcf file), or save the image to your iPhone or iPad's Photo Library. By default, images saved to OneNote will be in your main notebook, but you can change the location to keep your notes organized in a way that suits you. Note: If you’re new to OneNote, you’ll find images in the Quick Notes section of <Your First Name’s> Notebook. If you’ve been using OneNote for a while, your notebook will have a different name, like Personal, Personal (web), or My Notebook, and your captured content will be in the Unfiled Notes section. Images saved as Word files, PowerPoint files, or PDFs will be in your Documents folder in OneDrive so you can access them from any of your devices. PDF files can also be saved locally on your phone, and you can edit the save location for your PDF by tapping on the Save button. Office Lens doesn’t just import an image into a Word or PowerPoint file. The final Word and PowerPoint documents are real Office documents. 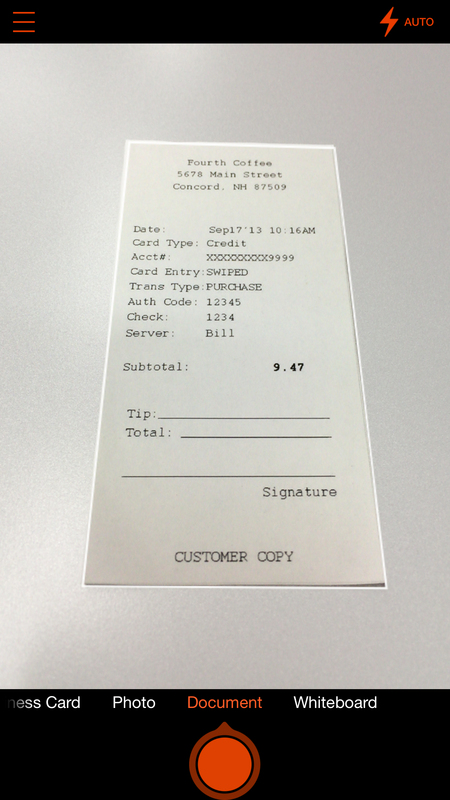 For Word, Office Lens recognizes the text, handwritten or printed, and the document layout. All of the text, formatting, and the layout in the Word document it creates is fully editable — just like you authored it at your desk. For PowerPoint, all of the handwritten lines and strokes are transformed into PowerPoint drawing objects that can be recolored, resized, moved around, and edited. You can remove the background of drawings as well, which makes it easier to reuse the drawings in other presentations.